Here we are, February 28th – and yes, tomorrow will not be March 1st, it will be February 29th. That only happens once every four years, in years divisible by 4, such as 1988, 1996 and 2008. That’s because a complete revolution around the sun takes approximately 365 days and 6 hours. So every four years, we’ve accumulated an extra 24 hours that we have to get rid of to stay on track with the calendar. Get rid of it – or see it as an incredible opportunity? What do you do with an entire day that is out of the ordinary – and extra bonus? This week Robert and Tonya Harris won $275 million in the Georgia lottery. With the unexpected money, will they invest in something meaningful or simply spend it? Okay, maybe you won’t win the lottery but you are definitely getting all 24 hours of an extra day on February 29th. Are you going to invest it or spend it? Here’s the time you’ve been looking for to read that great book. Or that’s enough time to fully develop your business plan to take you to a new level of success. Incidentally the first thing Robert did was quit his job so he could “live happily.” Now there’s a hot topic for another day! My wife Joanne was dismayed to see the signs stuck in the medians yesterday as we were driving leisurely through Franklin, Tennessee. Our local Hollywood Video store is closing. They recently filed for bankruptcy protection, citing increasing real estate and labor costs, and growing competition. They want to close 520 unprofitable stores and concentrate on 4,000 stronger locations. Frankly, I think they should liquate their stock and sell the real estate as quickly as possible. Look at the changing history in a comparable industry – music. I still remember the 331/3 rpm vinyl records. I listened to Pretty Woman and I Want to Hold Your Hand by spinning the big discs. Then we saw 8-track tapes. Soon we had the marvelous introduction of the smaller and more efficient cassettes. Then came CDs. And now we have digital downloads that don’t require any physical product at all – and you can select just one song rather than being forced to purchase the other 10 you don’t care about. Would you want to be a vinyl record manufacturer today? 1. Carmike Cinemas – you drive out to the local shopping mall, park the car, fight the crowd, spend $10 for each family member, $7 for a bag of popcorn and then sit down right in front of 8 giggling teenagers. 2. Hollywood Video – you get in your car, go across town to the nearest location, browse through the possibilities, make your selection, discover all of that title are currently loaned out, choose another title, go home to watch the movie and then hope you remember to reverse your trip the next day to avoid the late fee. 3. Netflix – you select your favorites, the physical DVDs arrive in the mail a few days later, you watch them, make some new selections, send back the watched movies and wait for your new batch to arrive. 4. iTunes – you log on the iTunes site from the comfort of your own home, take 30 seconds to find your selection, instantly load it to your laptop, eat your own $.99 popcorn and include 6 family members at no additional cost. Where would you put your money if you were going to invest in one of these models? Let me ask you this? Where is your current job or business on this development scale? Are you hoping for revival in a model that is dead? Are you using business principles that were effective 20 years ago – but are dreadfully out of date today? Are you going to fight to continue selling typewriters – or can you see the writing on the wall and embrace the inevitable changes? 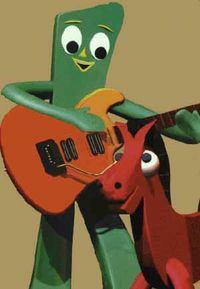 Remember the green clay humanoid figure named Gumby? If you ever had a model Gumby you will remember that he was infinitely flexible. It appears ole Gumby is pretty welcome in today’s workplace. 75% of the employees at Best Buy’s corporate campus participate in their Results-Only Work Environment (ROWE). 40 percent of Sun employees participate in that company’s “Open Work” program, in which they have the freedom to work flexible hours and off-site. Nearly 50% of the 25,000 employee work force at PNC Financial Services Group is on some type of flexible arrangement including job sharing, telecommuting and compressed work weeks. Some companies are saying flexible work arrangements are available to all staff. Companies everywhere are discovering that happy workers are more productive – and one of the biggest factors in keeping people happy is providing them flexible work schedules and locations. Even the U.S. government has discovered that flexible work schedules result in “greater employee productivity, higher levels of sustained performance, reduced traffic congestion and air pollution, and reduced real estate costs.”Could you imagine working from home for your current employer? Would you want that arrangement? Do you have a place in your home where you could have a work mind-set? Do you need help in creating a flexible work proposal for your boss? Is the company going to choose your proposal or insist on keeping the slob in the cubicle who drinks too much company coffee, wastes company time by surfing the Net, and expects to be paid for time chatting with the new gal in accounting? The sultan of Persia had sentenced two men to death. One of them, knowing how much the sultan loved his stallion, offered to teach the horse to fly within a year in return for his life. The sultan, fancying himself the rider of the only flying horse in the world, agreed. Wow! I like this guy’s thinking. Rather than giving in to victim mentality and acquiescing to his immediate death, with one creative suggestion, he creates four possible outcomes for his future. Okay, why the “Free Beer Tomorrow” lead-in? I always chuckle when I see this popular sign in the window of pubs around the world. Of course, it’s a joke since it is an eternal promise that is always unfulfilled. And yet the promise of a better tomorrow is not to be taken lightly. From concentration camps to the finest academic institutions we see examples of those who can survive horrific circumstances or die in despair in the midst of the finest opportunities known to man. Without the hope of a brighter future tomorrow we are all doomed. Many of you are in positions where you can offer hope to those questioning what tomorrow will bring. Whatever your service, know that it’s not just your brilliant knowledge that people are looking for. In addition they want to be assured that there will come a better day. Incidentally I’m not a beer guy – I’ve never had one in my life. But I like the thought behind this phrase nonetheless. 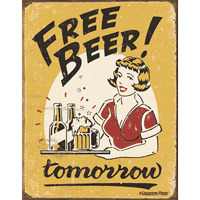 Don’t be surprised if you see a “Free Beer Tomorrow” sign in my office window — tomorrow! Mercy Me Bart, Just Get a “Real” Job! As I was writing today a song from the incredible new Mercy Me album, All That is Within Me, was playing on the iTunes radio station. It reminded me of Bart Millard’s explanation for the name of their group. 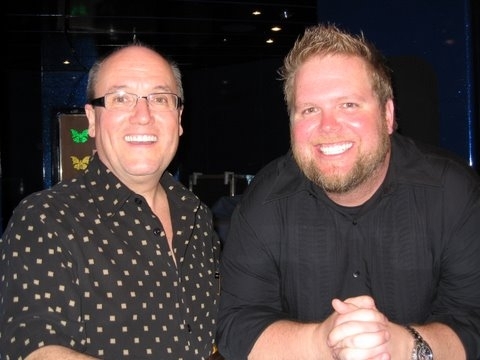 We were on a John Tesh cruise together last year and Bart told how he and two friends formed their little group and started signing at church camps. They would receive a “love offering” and with those contributions of $20 and $30 would attempt to buy hotdogs for the week and put gas in their car. One evening he was describing their then current situation to his Grandma. In exasperation Grandma said, “Mercy me Bart, why don’t you just get a real job?” And thus the name, Mercy Me, was birthed. And eight million albums and seven Dove awards later, Bart can laugh about Granny’s frustration. How many of you had a Grandma, or a Mom or Dad, or Uncle Harry or respected teacher who told you to forget your dreams and just get a real job? My own Dad understands milking cows or picking corn to create income and encouraged me to do the same. He still doesn’t fully comprehend why people pay me for just talking and writing. I’m not sure I do either — it’s just that I love what I’m doing — and I sure don’t miss those cows! Yeah, that’s Bart and me in the photo. Is Your Music Still in You? Oliver Wendall Holmes once said “Many people die with their music still in them.” I think that captures the fear of about 99% of the people I see who come in for career coaching. Either they know exactly what gift or talent they have that they are not using or they are just afraid they have somehow missed finding their real authentic and fulfilling path. What is that area that is lying dormant for you? I recently had a pharmacist approach me at the end of a short presentation I titled Hold Fast to Dreams. He said he had been in his profession for 17 years and could not think of any dreams he had. In his description of his “responsible, predictable” life it became clear to both of us that his dreams had become buried along the way. All those childhood passions had been put aside as one responsibility led to another. At this point he was so desensitized that he couldn’t even bring them to mind anymore. He began weeping in the 3 minutes of our conversation as he identified his current life. You know the symptoms: as a child you loved singing but now you haven’t sung in 20 years. Or every time you see a news item about the starving people in Africa it brings you to tears – but you’ve never done anything to help. Or when you see a beautiful painting you remember how much you loved that second grade art class. You may recognize that whenever you are around old people you are energized by the compassion and wisdom they have – but you only go there once or twice a year. Change – even when unwelcome or unexpected, often wakes up those dormant dreams. I have seen physicians move to the country to take up organic gardening, pastors who switched to fulfilling careers as artists, and housewives who emerged from the years of raising children to release their gifts in writing and counseling. Check out this 7 year-old singing the National Anthem. He’s getting his “music” out. It will be interesting to see where he is 30 years from now. Will he be enjoying singing as he does today? Or will the realities of life have him push that down as “unrealistic” as he goes off to his cubicle each day? I’m in “ministry.” Can I still be rich? Each week I create a new online radio podcast – answering a few of the many questions we receive. Here are some of this week’s questions you can hear discussed on Dan’s Online Radio Show. I begin by talking about the Venn Diagram (like this image) model of business that I use – and how that may help you see multiple streams of income in whatever you are doing. I have seven revenue streams from different systems that are in place. General Motors announced today that they will be offering buyout packages to their entire U.S. hourly workforce – 74,000 workers. These “please leave” packages will offer between $45,000 and $65,000 to leave the property now. And that’s with continuing full pension and health care coverage. If you’ve been there 10 years and you’re willing to give that up as well, you can just grab a cool $140,000 and ride off into the sunset. Here’s where hard negotiating has gotten a GM worker today. The current UAW member at GM has an average base of $28.12 an hour – but, with the cost of benefits, including pension and health care costs, that hourly figure rises to $78.21, according to the Center for Automotive Research. So do the math on that one. At just a normal 40 hours a week, that translates out to $162,676 annually. Hey I know physicians and dentists who don’t make that kind of money. Of course that also put General Motors on track to post their worst year in history in 2007 – reporting a net loss of $38.7 billion. Okay, you may not think it’s “fair” to be eliminating workers in order to bring in new people at less than half the cost. But if you think you are owed “security, predictability and retirement” you’re going to be disappointed. No company can survive a business model with this kind of loss and where labor costs are so disproportionate with the rest of the world. Has this been my dream job – the fulfillment of my purpose here on earth? How likely is it that I will have any job here two years from now? Is it reasonable to think that any company can survive with a one-year $38.7 billion loss? Can I come up with 4-5 possibilities for ways I could invest $140,000 to see a good return? Do I have valuable skills that could benefit any number of other companies? Is this my golden opportunity to start my own venture? How fast can I get my check? I love seeing innovative ideas come to life. I like watching Donnie Deutsch’s The Big Idea where he interviews people like friends Julie and Mindee with their new product Boogie Wipes. A simple idea with a clear business plan. Then I see kids working on biomedical ideas to come up with winning products like a recent team from Johns Hopkins University. They developed the Ratavirus Vaccination. This dry form vaccine will eliminate problems associated with refrigerating and distributing liquid form vaccines in less-developed countries. The 2007 second place submission, entitled enLight: Enabling Life with Light, was developed by students at Stanford University. This novel treatment for Parkinson’s Disease enables the effective and reliable control of neural activity using light. The device combines gene delivery of a light-sensitive ion channel with an implantable optical stimulator to directly and specifically control the neurons affected by Parkinson’s. Whoa – when I was their age I was proud of using a clothespin to hold a piece of cardboard against the spokes on my bicycle – made a really cool sound. The point is – there is a place for moving ahead with your idea – whether it’s a biomedical marvel or a better bicycle spoke noise maker. Too often I hear people say, “I wish there was a better _______.” Then two years later they see the very item and say, “Well I thought of that way back when.” Just be aware that ideas are a dime a dozen. Having a great idea puts no money in your pocket. Thinking about an idea or visualizing a novel or improved product is a great mental exercise but doesn nothing to help others or improve your bank account. But the person that creates a plan of action – and ACTS – now that person can end up very rich! Browse around on the U.S. Patent and Trademark Office site to see if something similar is already in existence. Need more help on developing your idea? Check out my blog page on Inventions, Patents & Trademarks. I began this podcast with a 15 minute tirade about MLM companies. Yes, they are a hot potato issue – lots of negatives and some positives — but the real issue is whether the business model is a fit for you. Listen for my explanations about how to evaluate any business idea. 1. Yesterday, my boss pulled me into her office and asked if I really disliked my job. I didn’t realize I was showing how much I hate this job. I was given the option of searching for a job while I work for a month, but I feel like this is rather risky. 2. I’m a women over 50…how do I get my foot in the door once they see my resume and deduct that I’m at least over 40 and possibly 50? I’m in shape, take care of myself and could sell myself better in person …..it’s just getting that initial interview!!!! 3. Dan I’m a 45 year old male with 15 of experience as a web/graphic designer. I bought your book and one of your courses, got fired up cashed in my 401k and left my corporate job. Six months later I’m broke and don’t have any money to pay my bills. My wife is not happy and this is not the first time I try to go on my own. Now I dread just getting a job. 4. I am a bank vice president with an MBA in finance and years of experience. I am interested in teaching finance/business classes online. What steps do I take? 5. Is it ever ok to quit a job without having another one lined up? I started a new job recently and dislike it intensely but have little time off to interview.